I was lucky enough to be invited to a wedding in the Red River Gorge of Kentucky last weekend. I knew it would be scenic but what I experienced surpassed every expectation. 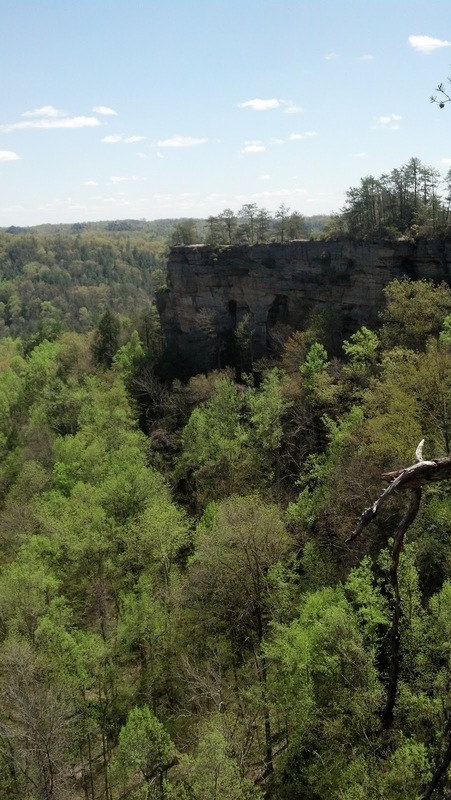 The Gorge was about a two-hour drive from Louisville. Luckily our rental, a Prius hybrid, boasted almost 50 miles to the gallon. We pushed buttons and more buttons trying to figure out how to turn it on, and after a few minutes of fumbling and consulting with the guidebook we finally figured it out. (The car is so quiet that I had trouble discerning when it was actually on at times.) The high-tech screen was impressive though. From the road I admired the famed rolling hills of Kentucky, the farms, grazing horses and cows, tall trees and signs for historic landmarks. I was dying to visit the distilleries, but alas, there was no time. Our first stop was Nada Tunnel, which used to be a railroad tunnel. Now, after stopping to check for oncoming cars, cars can drive through it, one direction at a time. It’s a tight fit, claustrophobic even. The recent rain created a mini waterfall over the entrance. 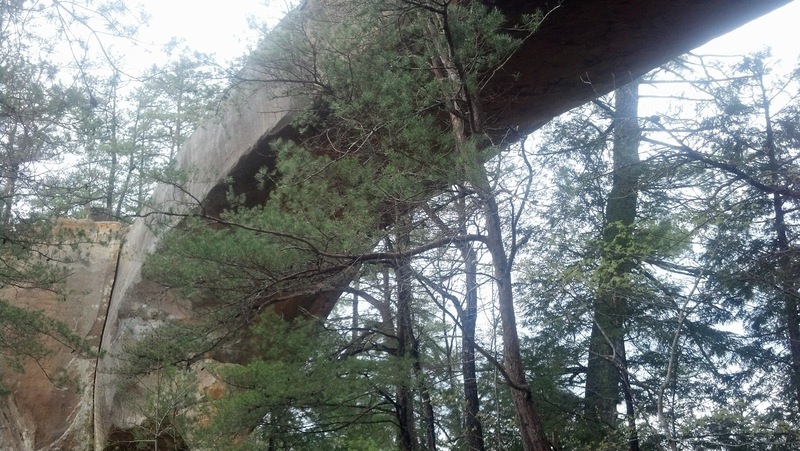 We then explored Sky Bridge and Sky Bridge overlook, the wedding location. The hike was little muddy at times but a welcome change from the dry heat in the Valley. Everywhere I looked I saw green, though natives told me this was just the beginning. Our cabin, rented via 5 Star Cabin Rentals, was accessible via a bridge and stairs — a short hike that made transporting our luggage quite the workout. 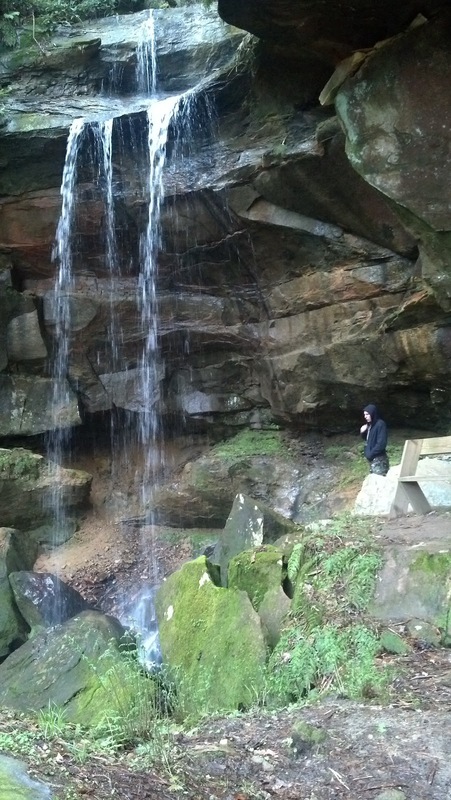 Its most impressive feature was a waterfall behind the our home in the woods. And we had it all to ourselves! The day of the wedding began with a pancakes and a hike to Natural Bridge. 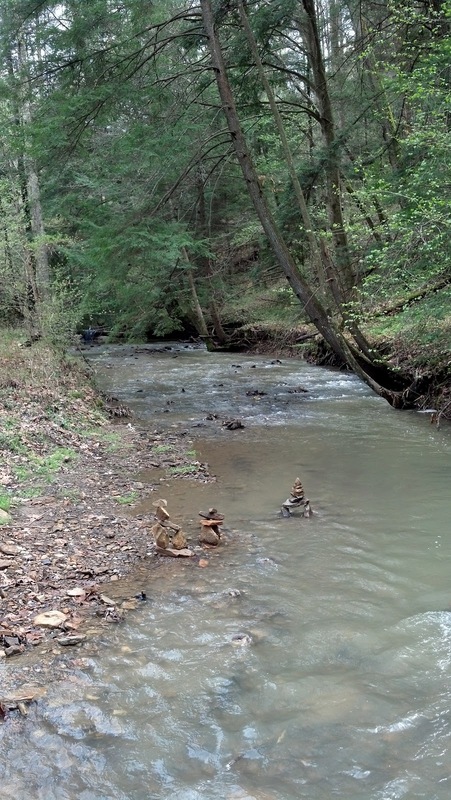 The trail was short — just over .5 miles to the bridge — and easy. The scenery was green and luscious. Temperatures in the 60s and sunny skies completed the perfect day. 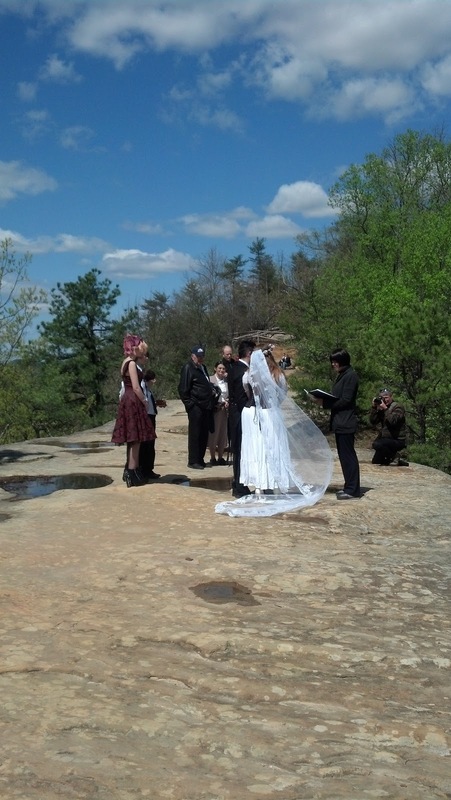 While absorbing the beauty of the landscape from atop Natural Bridge, a wedding party arrived. It was put on by My Tiny Wedding, which organizes small nuptials in the area. The hike continued toward an overlook. We passed the ski lift, which the bride and groom had used to get up to Natural Bridge. We soldiered on despite the abundance of mud on the trail. And we were rewarded with even more stunning views. We also visited Lovers’ Leap and saw Devil’s Gulch. Our final hiking destination that weekend was Indian Staircase, which I was told was an unofficial trail. And I can see why. There were other finds on the hike. One was Frog Rock, which resembles its namesake. I don’t recommend this. At all. The end of the hike resembled a scene from Lord of the Rings. Wildflowers and moss accented the landscape, a parting gift from nature. Can’t wait to see you again, Kentucky!